A strong typhoon is slowly passing over Okinawa area. Unsettled weather continued for a few days. 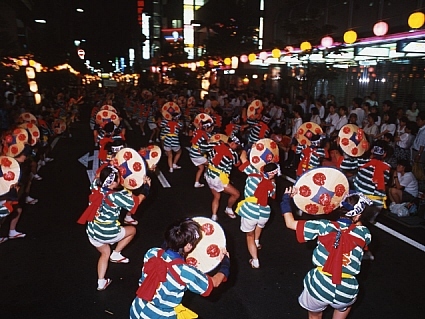 The Yamagata Hanagasa Festival(山形花笠まつり) is being held in Yamagata City, Yamagata Prefecture from August 5th to 7th. Hanagasa(花笠) is a bamboo hat decorated with artificial flowers. People dance to "Hanagasa Ondo" which is a popular dance song in Yamagata area. The well-known phrase "Yassho, Makasho(ヤッショマカショ)" is repeated in the song. Around 1935, the song was made from a traditional folk song that construction workers sang to keep time when building a bank and its choreography was composed. 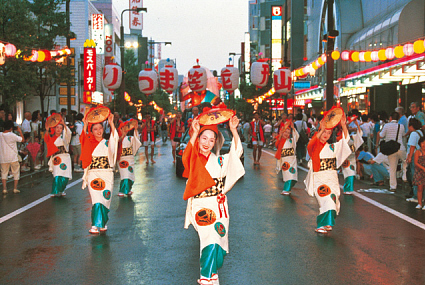 This festival, which began as part of a parade to promote tourism in 1963, is a dance parade including various Hanagasa dances performed in many parts of Yamagata.